If you are one of those meticulously organized types who require a printed label for everything that you own, then you are probably very familiar with Dymo. I had a chance to try out the Dymo LabelWriter 450, and I am surely tempted to label everything in my home, my city, and the world! As you can see by the photo, the LabelWriter 450 comes with two spools for printing. This second roll can be used as a backup in case your primary printing roll runs out, or for printing large batches faster by loading two rolls of up to the same label. I’ve heard that you can print up to 71 labels a minute. The best part about it is that no expensive ink or toner is required. According to the QuickStart Guide, the LabelWriter “uses heat from a thermal print head to print on specially treated labels. Labels are the only supplies you will ever need to buy”. Set up for the LabelWriter was very simple. All I had to do is insert the software, which took quite a while to download programs that it needed to use the LabelWriter 450. It was very specific about not plugging in the printer into the USB drive until all the software was installed. Once I plugged it in, my computer recognized it right away, and I printed my first address label in seconds. 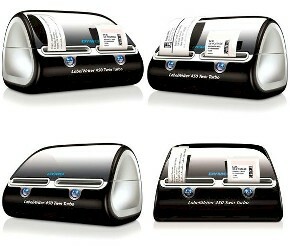 The Dymo LabelWriter 450 comes with a roll of Stamp labels and a roll of address labels. It is available for purchase off the DYMO site for about $210.